HomeBlog June 2016 New FolkArt Product Launches! We introduced you to our new FolkArt® products debuting this year at CHA in January, and we’re excited to announce that they’ve hit the shelves! 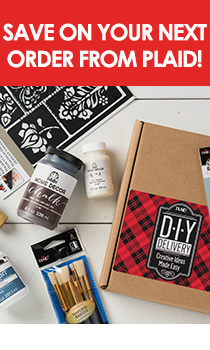 Our team works to bring you everything you need to help make your creativity shine, and these exciting new products bring innovation and ease to any DIY project! FolkArt Milk Paint gives effortless farmhouse chic to any project. The non-toxic, durable, casein-based paint can be used to create everything from a distressed aged finish to a smooth finish. The premixed formula brushes on like a stain and looks like a paint. It’s beautiful on raw wood and vintage pieces and comes in 33 rich colors. Specially designed FolkArt Milk Paint brushes are made of 100% Natural Hog Hair bristles and come in a 1.25” and 2” size. Pair with FolkArt Milk Paint Finishing Oil to seal and protect raw wood projects, and you can use FolkArt Milk Paint Bonding Primer to prepare previously painted surfaces and as a sealer/topcoat. We’re also bringing you a way to add dimension and texture to home decor accents! FolkArt Painted Finishes in Rust, Concrete and Moss give dimension and texture to smooth surfaces and are indoor/outdoor friendly. The FolkArt Painted Finishes Brush Set makes it easy to add depth with thick or textured paints. And our FolkArt Barnwood Stain & Wax creates authentic looking barnwood from raw wood for indoor use! Brush on bold with new FolkArt Ultra Dye! Great for wood and natural fibers, FolkArt Ultra Dye’s unique acrylic formula can be used to create ombre effects, with stencils or vibrant solid colors. FolkArt Ultra Dye Satin Varnish seals and protects projects, while FolkArt Ultra Dye Brushes provide smooth application. Find our new products and retailers across the nation and at Plaid Online. Don't forget to sign up for our email newsletter for more inspiration and tutorials using our new products!